This article is about the Mexican dish. For the insect, see Machaca (insect). Machaca ma't͡ʃaka is a traditionally dried meat, spiced beef or pork, which has been rehydrated and used in the popular local cuisine of Northern Mexico and Southwestern United States and which is easily available from many ethnic groceries and supermarkets in these areas. In areas where the dried meat product is not easy to obtain, slow cooked roast beef (brisket) or skirt steak shredded then fried is sometimes substituted. 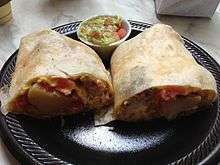 Prepared machaca can be served any number of ways from tightly rolled flautas, to tacos, to burritos, or on a plate with eggs, onions and with peppers (chiles verdes or chiles poblanos). Machaca is almost always served with flour tortillas, which tend to be large, up to 20 inches in diameter. 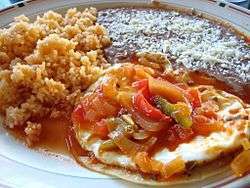 A very popular breakfast or brunch dish is machaca with eggs, associated with miners in the State of Chihuahua. The dish is known primarily in the north of Mexico, and the southern regions of the U.S. states of Arizona, California, and New Mexico. However, in central and southern Mexico, it is not well known by lower socioeconomic classes. Machaca was originally prepared most commonly from dried, spiced beef or pork, then rehydrated and pounded to make it tender. The reconstituted meat would then be used to prepare any number of dishes. While drying meat is one of the oldest forms of preservation, the drying of beef with chilis and other native spices was developed by the ranchers and cowboys of northern Mexico. After the arrival of refrigeration, dehydration was no longer needed for preservation. Most dried beef is sold in the U.S. as jerky. In Mexico, it is still sold for cooking as well as snacking; however, this is done mostly in the north and in small-scale operations. Most machaca dishes now are made from beef that has been well-cooked, shredded then cooked in its juices until the desired consistency is achieved, which in Phoenix can be soupy, dry or medio. In Tucson and south, the preparation is almost always dry, and approximates more closely the taste and texture of the original dish prepared from dried meat. Carne seca is an alternative name for machaca in Tucson and Sonora. ↑ Adame, Homero (3 November 2013). "El origen del machacado con huevo" [The origin of machacado con huevo]. Mitos y leyendas de Homero Adame (in Spanish). ↑ Torres, Armando (22 March 2012). "Tía Lencha ampliará su mercado de exportación" [Tía Lencha expand its export market]. El Economista (in Spanish). ↑ "Estados Unidos abre frontera a la machaca". El Horizonte (in Spanish). 30 July 2013. 1 2 Chavez, Stephen (August 19, 2014). "A breakfast of machaca con huevos". Alhambra Source. ↑ Chavez, Stephen & Rodriguez, Art (December 26, 2013). "Latino Recipes For The Holidays: Machaca Con Huevos". Huffington Post. ↑ Newburn, Paisley (February 20, 2014). "Delicious discoveries in Mexican cuisine". Phoenix (UBC Okanagan student paper). ↑ Griffith, J.F. (April 1997). "La Comida Mexicana en Tucson" (in Spanish). El Folklórico del Sur de Arizona. ↑ "Machaca con Huevo" (in Spanish). Instituto Tecnologico y Estudios Superiores de Monterrey (ITESM). Archived from the original on 2007-09-27. Retrieved 2007-07-30. ↑ Mitofsky, Consulta (October 2006). "Consumo de Platillos Tipicos: Encuesta Nacional de Viviendas" (PDF). Archived from the original (PDF) on 2008-02-27. 1 2 Jamison, C.A & Jamison, B. (1995). The Border Cookbook: Authentic Home Cooking of the American Southwest and Northern Mexico. Boston: The Harvard Common Press. ISBN 9781558321038. 1 2 Ibarra-Armenta, A.S.; Valdez-Urías, D.B. ; Zamorano-García, L.; Cumplido-Barbeitia, L.G. ; González-Ríos, H. & González-Méndez, N.F. "Estudio y Mejora del Proceso de Secado de Carne de Bovino para Carne Seca y Machaca." (PDF). Archived from the original (PDF) on 2012-02-10.